Oswego County Legislator Terry Wilbur serves lunch to Mack (left) and Mary Stock at OCO’s Hannibal Dining and Activity Center during last year's OCO Nutrition Services March for Meals campaign. OCO is inviting area mayors, legislators, and other elected officials to participate in this year’s March For Meals campaign by being a part of Community Champions Week, March 20 through 24. FULTON, NY – OCO Nutrition Services staff is inviting area mayors, legislators, and other elected officials to join them in their annual March For Meals campaign. 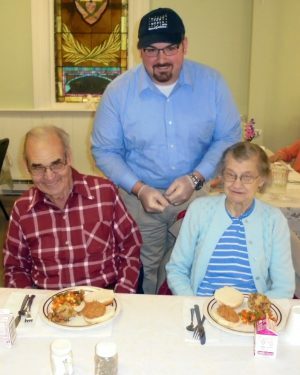 Oswego County Legislator Terry Wilbur serves lunch to Mack (left) and Mary Stock at OCO’s Hannibal Dining and Activity Center during last year’s OCO Nutrition Services March for Meals campaign. OCO is inviting area mayors, legislators, and other elected officials to participate in this year’s March For Meals campaign by being a part of Community Champions Week, March 20 through 24. The week of March 20 has been named Community Champions Week and OCO is inviting local officials to volunteer their time to assist with OCO’s Meals on Wheels program or help serve meals at OCO’s Dining and Activity Centers. Since 2002, Meals on Wheels America has led the March for Meals in an effort to fill the gap between the seniors served and those in need that is widening due to increased demand with a rapidly aging population combined with declining public and private resources, and rising food, transportation and operational costs. This March hundreds, of local Meals on Wheels programs across the country will reach out to their communities to build the support a program that delivers nutritious meals and provides friendly visits and safety checks to seniors all year long. Administered through OCO’s Nutrition Services and funded in part through Oswego County Office for the Aging, New York State Office for the Aging, and United Way of Greater Oswego County, the Home Delivered Meal Service delivers approximately 1,000 meals each day to homebound seniors throughout the county. Program participants receive two nutritionally balanced meals per day of service. Up to seven days’ worth of meals can be ordered per week. Additionally, OCO’s Nutrition Services administers six Dining and Activity Centers where seniors can enjoy a hot, nutritious noontime meal and visit with friends.